Can There Be Too Many Museums? In a controversial move, Washington, D.C. mayor Muriel Bowser last week killed plans to open an Institute of Contemporary Expression at a disused, rodent-infested, leaky-roofed historic school in the city’s northwest quadrant. Predictably, she was pummeled by critics, some of whom say she would rather have a commercial venture in that space (which is protected and cannot be razed). It may be that politics influenced her decision, but a look–at least from afar–at the dynamics give me pause too. Sometimes, there can be too many museums–if those museums don’t come with stable financing. A recent study in Philadelphia, more about which in a moment, suggested that. And just look at the Corcoran situation in Washington: why couldn’t that board raise money to support a great collection and school? …set the project aside, withdrawing legislation that would authorize it and firing the project manager overseeing it. Her staff asserted that the project’s supporters, led by local art collector and businessman Dani Levinas, had missed fundraising deadlines, which Levinas and his supporters steadfastly dispute. Levinas and his allies wanted to create a place for “large-scale, highly visible temporary exhibitions that traditional museums are often unable to accommodate.” His model, apparently, was the Park Avenue Armory in New York, among others. Levinas and EastBanc [the developer] committed to raising $13.2 million for the project, and planned to generate future revenue by charging patrons for entry after the museum opened. …ICE-DC is a project that will have significant impact on our city. As a center for creativity, education and innovation, it will also serve as an economic engine and driver of development in the neighborhood. 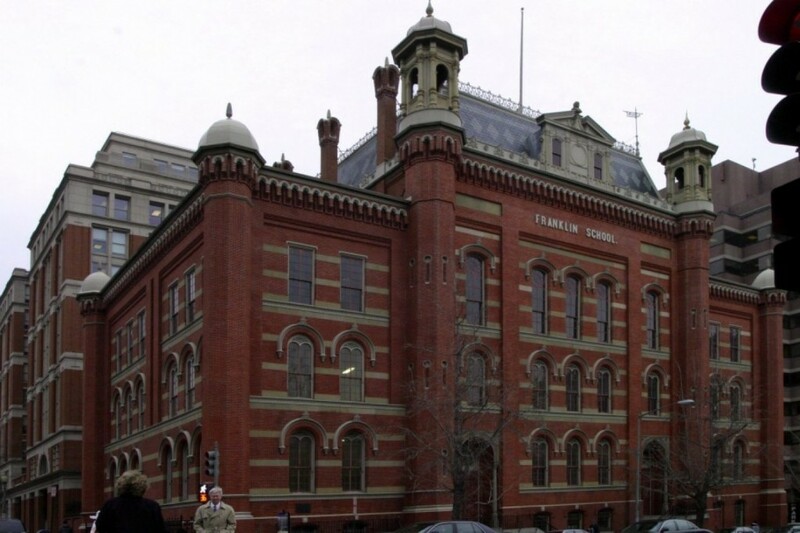 Critically, ICE-DC has the unique capacity to simultaneously use and preserve the Franklin School’s historic and beautiful interiors as originally conceived. This significant and sensitive alignment of resources and vision will provide education and programming to the children of Washington and citizens of all ages. I am all for historic preservation, and I’d like to believe that the founders have, as they have said, been raising money–perhaps as much as $7 million. But $13 million, if they get that, is not enough to support a museum. What about that operating budget? Back in 2011, when I did a Cultural Conversation with Rebecca Robertson at the Park Avenue Armory for The Wall Street Journal, the Armory’s operating budget was $8 million–it has, I would bet, gone up. The New Museum’s–another model cited–is more, $12- to $13 million. Many organizations remain financially weak and under-capitalized, hampering the sector’s ability to sustain itself, let alone grow. Growth (and sustainability) is dependent on external factors including audience demand. Artistic quality alone will not guarantee increased attendance, especially in an environment with increasing competition for leisure time. Growth is largely driven through investment from a relatively small group of philanthropic investors. Funders and organizations both have a responsibility to evaluate when growth is wise and sustainable; and how best to plan or support downsizing, mergers, or appropriate exits for nonprofits where appropriate. The Greater Philadelphia Cultural Alliance, an advocate for the arts, applauded the William Penn Foundation for undertaking its study. It also directed people to look at the results in its 2014 Portfolio, an analysis of a larger sampling of the city’s arts and culture sector. A word of caution, no matter how motivated, isn’t always bad. Sometimes, it’s downright warranted.